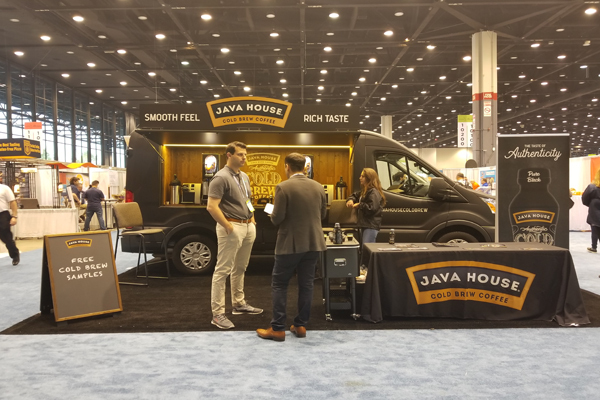 I just returned from my first National Restaurant Association (NRA) Show, which took place in Chicago, Illinois, 19-22 May, and I had quite the feeling of déjà vu as it was also my first time returning to McCormick Place in about a decade. I used to go there annually and trek across all three buildings for the International Housewares Show. There was certainly much more tasty sampling at the NRA Show! As with food, many beverage trends start in foodservice before retail, hence, I was on the lookout for newness. In terms of hot drinks, there was no discernible new trend. Many of the tea companies were focused on getting restaurants to elevate their tea programmes to either more tea offerings or better quality — from the traditional bag and string to sachets or pyramids. 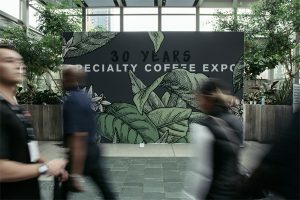 Nespresso was highlighting its women in coffee campaign within the restaurant industry, where sustainability/eco-friendly across all food sectors is a growing movement. The one aspect of coffee and tea that was trending, was cold brew. Its presence, including nitro cold brew, was strong at the show — even some tea companies were promoting nitro. Evidencing the popularity of cold brew coffee, even casual restaurant chain Denny’s (known primarily for breakfast and lunch) which has about 1600 outlets across the US, launched cold brew earlier this year. (Denny’s cold brew – “Steeped in cool water for 12+ hours for a silky, smooth flavour” – is available unsweetened or sweetened.) At the show, JoeFroyo was promoting its coffee/yogurt cold brew that is made with Real California Milk but is also lactose-free and has probiotic cultures. 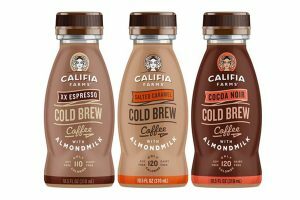 As cold brew is still growing among consumer awareness, and functional coffee is extremely new, it will be interesting to see how consumers respond to functional cold brew. After his presentation, “Key Trends Shaping the Future of Foodservice,” B. Hudson Riehle informed me that research is showing that cold brew’s popularity is not just being driven by millennials, but by baby boomers as well given its perceived health benefits (lower acidity and a sweeter, smoother taste leads to using less sugar and/or dairy). 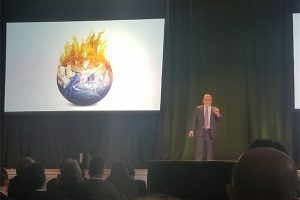 During his presentation, Riehle said that labour issues were top concerns for the industry and managing labour costs are critical for the viability of foodservice operators. It is also crucial for foodservice operators, and restaurants especially, that websites – emphasis on menus – are smartphone compatible and kept current. In the session, “The Future of Restaurants,” where the discussion focused on technology and robotics (a robot named “Penny,” developed by Bear Robotics, can serve as a food runner or busser), the moderator, Daniel Burns, author of The Anticipatory Organization, and panelists challenged foodservice operators to shift from adapting to trends to anticipating them in advance and using technology to elevate and enhance customer experience. The NRA Show’s keynote speaker was Condolezza Rice, the 66th Secretary of State of the US, who spoke on a variety of topics including how the international economic system has changed, applauded efforts in technology, but warned against losing the human touch. Referring to middle-aged people who are not trained in digital tools, she said, “Before you automate people out of the workforce, you should think about how to retrain them.” Words of advice that can be applied across many sectors.